Smart Design Does More Than Help Grow Food. I believe all food gardens can serve double duty. The first one is obvious. The second one…not so much. Most people only plan for the delicious flavors they will be harvesting from their food gardens. That’s not a bad thing. But I want to challenge you to think beyond the produce for a moment, because a garden – ANY garden – can bring you so much more than a delicious tomato. In this week’s podcast episode and post below, I interview garden designer Susan Morrison. 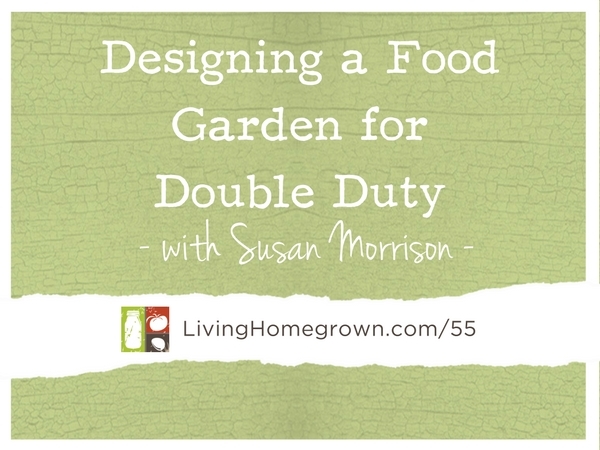 She shares her insight on creating a garden that serves double duty. A garden can be beneficial for both the gardener and the wildlife around that garden. And by drawing in wildlife, pollinators and beneficial insects, we are creating a haven that will serve you more ways than you originally intended. 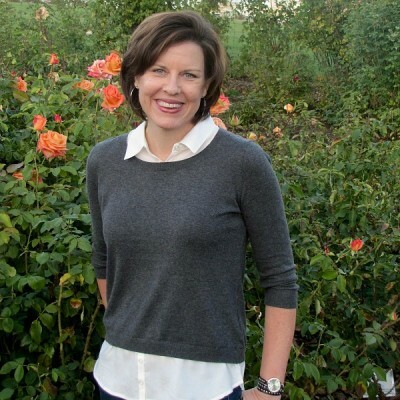 Landscape designer, Susan Morrison is a nationally recognized authority on smaller-sized outdoor spaces. She specializes in teaching people how to make a big impact with even the smallest of spaces. Susan is also a popular speaker and writer and her work has been featured in the San Fransisco Chronicle, Cottages and Bungalows and Fine Gardening Magazine. That in a nut shell is what makes all gardens so appealing. Susan says that we have to remember that our gardens are living things with the ability to take us outside of our ourselves and into a world that can help us de-stress. And you can have that connection just as easily with a food garden as you can with any other garden. All it takes is adding some smart design elements into the landscape. Although Susan feels there are 4 important design elements to any garden (Color, Scent, Sound, Movement), I have her focus on just two for this interview: Water and Movement. Adding color and scent to your garden is a pretty straightforward endeavor. But adding sound and movement can be a little more elusive to many of us food gardeners. Below are some of the highlights of our podcast conversation. First, let’s define the term “pollinator”. A pollinator is any animal or insect that helps plants produce fruit or seeds. They do this by moving pollen between flowers and fertilizing the plant. And in the case of a food garden – the more pollination we get, the more produce we get! But drawing in more pollinators does more than just increase the production of our garden. By bringing in more life to the garden, we are adding an element that transforms the garden into a place to observe, relax and enjoy the nature you have drawn there. In other words, those pollinators are serving double duty. Water is a great way to attract more pollinators and help us de-stress at the same time. It not only provides something that wildlife needs to survive, but the sparkle of moving water can be a beacon to birds. In fact, the sparkle of moving water will make a bird choose your garden over your neighbor’s garden. And moving water is a GREAT way to add sound to your garden! Adding water can be as simple as adding a bird bath. But to get movement, sound and sparkle, you can simply add a small fountain as a water feature. This fountain does not need to be large to attract birds. It can be small and simple. You can use something like a jar fountain (purchased or DIY) or you can even add a small fountain pump to any bowl or container of water on your patio. The water will shimmer to draw in birds and insects and the sound will be soothing to you as a gardener. Bees are one of the most fascinating creatures to watch in the garden. Unless you are extremely allergic, you really have nothing to fear from bees. They are far too interested in foraging to give you much attention and are gentle by nature. It only takes a few carefully selected plants to have a big impact on drawing in pollinators like bees and butterflies. Here is a plant list of easy to find plants that are huge favorites of the bees. Neonicotinoids – What they are and why we should care! This is fabulous! You two rock it all!